Headed to Ghana, Australia, New Zealand, or pretty much anywhere? KnowRoaming's got your data needs covered with 7-day data packages for just US$25. Use code PRINCETRAVEL50 for 50% off a Global SIM Card or Global SIM Sticker! After many months of anticipation, I’m finally about to embark on my whirlwind round-the-world Aeroplan redemption tomorrow evening. Over the course of the next three weeks, I’ll be jetsetting across West Africa, Turkey, Australia, New Zealand, China, and Micronesia. Let me tell you the story of how this audacious and frankly somewhat outlandish trip came to be. I wrote about the trip back when I booked it in June of last year, so I won’t rehash all of the details in that article and you can go back for a quick catch-up. The idea was that I needed to be in Beijing for Chinese New Year, but at the same time I wanted to book a trip that took full advantage of Aeroplan’s extremely generous stopover and routing rules. With the future of the Aeroplan program up in the air, there’s a fair chance that killer opportunities such as the Aeroplan Mini-RTW won’t be available for much longer. Having written extensively about some of these creative round-the-world itineraries, I figured I really needed to practice what I preach, and take one of these trips myself. So thus began the trip planning. First things first – Beijing would naturally be one of my three stopovers, in order to partake in the Year of the Pig festivities and spend the holidays with my family (something I haven’t done for a good seven years or so now, living out here in Toronto). Next, I knew that setting the “destination” of my trip as far away from the origin as possible would give me the highest maximum permitted mileage (MPM) within Aeroplan’s routing rules (go back to this article for a primer on MPM and how it works). And so the destination of the trip became Perth, Australia, and that gave me an MPM of about 18,000 miles to work with. I had one more stopover that I could use, as well as plenty of long layovers of up to 24 hours. Eventually, I decided to channel the spirit of the “Oddball Trips with Aeroplan” article I had written a long time ago, and incorporate both the African Hopper (a series of intra-Africa flights on Star Alliance airlines) and the United Island Hopper (a unique route throughout the Micronesia region operated by United Airlines) on this trip. Again, you can go back and read my “Is This the Craziest Aeroplan Trip Ever Booked?” post for the full details of my thought process behind the trip. Speaking of which, I’m happy to report that ever since that article’s publication, several readers have emailed me saying that they’ve been inspired to book similar (and in some cases, even more ambitious) trips, so I’d say the answer to my question is a resounding “No”! And so the trip, as it was originally conceived, involved a nine-hour layover in Abidjan, the largest city in Côte d’Ivoire, followed by three days in Accra, the capital of Ghana. I’d then jet out of West Africa into Istanbul, where I’d have a full day to explore. Then I’d be whisked away to Perth for three days, followed by Chinese New Year in Beijing. After that, I’d fly to Guam for a day, followed by a half-day in Chuuk and a full day in Pohnpei (both individual islands of the Federated States of Micronesia), and after that I’d complete the rest of the United Island Hopper through the islands of Kosrae (another state in the FSM), Kwajalein, Majuro (both part of the Republic of the Marshall Islands), and Honolulu (in Hawaii). And that’s how things remained for a long time, until a few developments shook things up even more. First off, an Ethiopian Airlines schedule change meant that my layover in Abidjan would be cut short from nine hours to six hours. Throw in the time at immigration and getting to and from the airport, and that means I’ll have three hours, tops, on the ground in Côte d’Ivoire. A Côte d’Ivoire e-Visa for Canadian nationals costs 73 EUR ($110), and I probably would’ve shelled out for a private driver to take me around the city as well. And for three hours? That felt like quite a significant added expense for very little meaningful sightseeing. My layover in Abidjan 🇨🇮 got cut to 6 hours thx to a schedule change. Thinking of just chilling airside in the lounge - e-Visa is 73 euros and hiring a driver likely $$$ as well. Then again, when's the next time I'll be in Côte d'Ivoire? What should I do? I’ll be chilling in the lounge at Abidjan Airport this time around, but I definitely hope to give Côte d’Ivoire a proper visit sometime sooner rather than later. The other development that threw a spanner in the works was the surprise availability of Singapore Suites on the Auckland–Singapore route around the same time I was going to be in Perth. With such a golden opportunity to try a coveted First Class product at my fingertips, I felt compelled to do everything in my power to get myself on one of those flights. So in the end, my Abidjan layover was rendered impractical, but I earned a two-day stay in Auckland on top of what I had originally bargained for. Let’s be real, though, what truly mattered on this trip was stretching Aeroplan’s generous allowances to fly to some remote and interesting places – the more remote and interesting, the better. Exactly which destinations these turned out to be? That was of secondary importance. Indeed, for such a huge trip, you could argue I’m barely doing the destinations any justice. What kind of first-timer in Australia goes to Perth instead of Sydney and Melbourne? And what kind of first-timer in New Zealand spends two days in Auckland and skips over the entirety of the South Island? I know this isn’t the perfect trip purely in terms of the travel and sightseeing factor, but I think that just speaks to the immense potential of using Aeroplan to travel the world extensively. After all, I’m flying solo this time around, since my intended travel dates didn’t quite fit with Jessica’s schedule (and, if I’m being honest, neither did the prospect of spending 14 hours puddle-jumping across the Pacific in a United 737). Next time, I’ll whip up another handful of Aeroplan miles and we’ll do a similar trip together, and on that occasion I’m sure we’ll be spending more time exploring everything there is to see down in Australia and New Zealand. Of course, the goal of flying a single Aeroplan itinerary to far-flung corners of the globe wouldn’t be nearly as much fun if I were doing it cramped in the back of the plane, so I was shooting for business class on as many segments as possible. As a North America to Australia redemption, the overall mileage cost would come to 160,000 Aeroplan miles. The itinerary begins in Newark, where I’ll depart for Abidjan by way of Ethiopian Airlines business class. I’ve actually already flown their 787 on their fifth-freedom route between Buenos Aires and São Paulo, but I’ll be taking notes as to how the long-haul experience stacks up. In Newark, I also get to visit the new United Polaris Lounge that recently opened. Having thoroughly enjoyed my stay in the Chicago lounge a few months back, I’m eager to see how the Newark location compares. After six hours in Abidjan, I make the quick hop across the Ghana border on South African Airways business class. This is another fifth-freedom route, as the plane continues onwards to Johannesburg after making a brief stop in Accra. 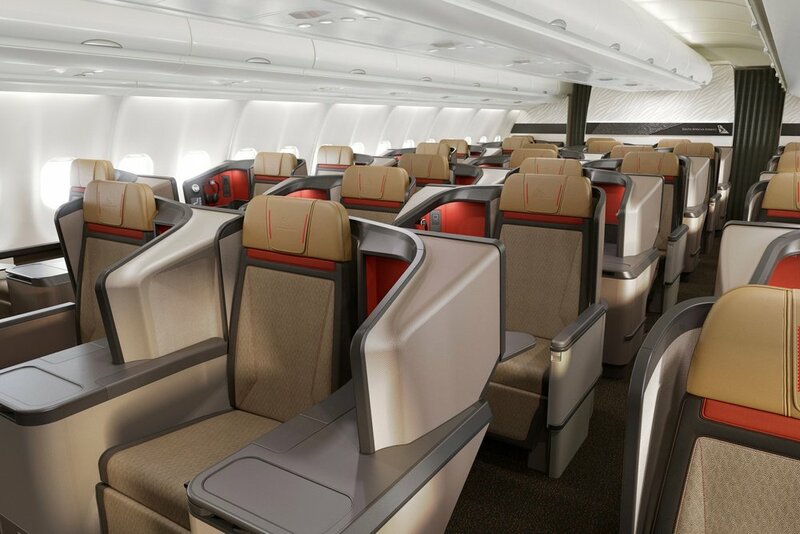 I’ll get to try South African’s relatively new A330 business class product, which looks very good in pictures. Next, Accra to Perth is a long way to fly, so I’m happy to be doing it with some of the world’s leading business class airlines. The overnight flight to Istanbul will be on a Turkish Airlines 737-800, which looks like it only has recliner seats. Meanwhile, the 10-hour flight to Singapore is operated by a Boeing 777, which I’ll be interested in sampling after having just recently flown on their long-haul A330 on the other round-the-world I just completed recently. Then, a Singapore Airlines Boeing 787-10 brings me to Perth, and this is a flight that I’m extremely excited for. It’s going to be my first time on a Boeing 787-10, and this product will also become the backbone of Singapore Airlines’s regional fleet in the coming years, so I’m eager to review it and share my thoughts. So that leaves me with a gap to fill between Perth and Auckland. I went ahead and booked a one-way economy ticket on Air New Zealand for 15,000 Aeroplan miles; sadly, Air NZ almost never makes any business class space available on this route. In what was not my brightest moment, the possibility of booking Qantas business class using Avios only occurred to me after the 22-day mileage redeposit window on my Air NZ flight had already passed. And so a six-hour haul in economy class it shall be! And hey, I don’t mind that too much, because a humdrum trans-continental flight in economy class sets the stage perfectly for one of the main events of this trip: Singapore Suites from Auckland to Singapore. That’s 10 hours of indulging in Singapore Airlines’s incredible Book the Cook catering, their famous in-flight service excellence, and the coveted Double Bed in the Sky (albeit on my own, sadly). Upon landing in Singapore, I’ll be able to cap the occasion with some more fine food and drink in the intimate setting of The Private Room, Singapore Airlines’s exclusive lounge for their First Class and Suites Class passengers. And after that, a rather unceremonious overnight flight with Air China will finally bring me home. Is that the end of the story? Not even close. Arguably the most special part of this trip takes place on my return journey as I embark on a bucket-list item for all aviation enthusiasts out there – the United Island Hopper. As I outlined in my initial post back in June, the main hopper route is United’s Flights 154 and 155 from Guam to Honolulu and vice versa, making quick stops in Chuuk, Pohnpei, Kosrae, Kwajalein, and Majuro. But United also has a few extra flights shuttling back-and-forth among Guam, Chuuk, and Pohnpei, and by choosing my flights strategically, I was able to engineer a few long layovers on those three islands, both to break up the journey a bit, and also to have a gander around the islands to the extent that’s possible. In stark contrast to the luxury hotel world tour I just completed, the hotels are very much an afterthought on this trip. I basically didn’t even start looking at hotels until last week. As is default these days, I looked towards the Marriott program for my three nights in Accra. The newly-opened Marriott Accra fit my needs perfectly, and as a lowly Category 3 hotel that cost just 17,500 Marriott points per night while the cash rates hovered around US$200, I felt I was getting spectacular value for my points. While I’ll only be passing through Istanbul for a day-long layover, I do plan on taking advantage of Turkish Airlines’s free transit hotel program and hopefully getting a bit of rest while I’m in town. Meanwhile, in Perth and Auckland, things were less straightforward. The hotels there are kind of expensive in cash, but even more so in points, so neither option felt attractive. In the end, I did what I usually do in these situations: I paid cash for the lowest rates, but then used MR Select points from my Cobalt Card to offset the purchases. I decided on the Westin Perth, which I booked for 215 AUD ($204) per night, as well as the Four Points by Sheraton Auckland (the only Marriott-branded hotel in the city), which I got for 216 NZD ($194) per night. That leaves me with a few more loose ends to tie up. First, one night each in Chuuk and Pohnpei, where (unsurprisingly) Marriott’s huge global footprint has not yet conquered. Following on the advice of some other travellers who’ve done the United Island Hopper, I’ll probably be booking the High Tide Hotel in Chuuk and the Seven Stars Inn in Pohnpei. I don’t expect either to be too expensive. After Pohnpei, it’s non-stop Island Hopper action until I arrive in Honolulu at 2:50am. My flight out to Newark doesn’t leave until 4pm that day. During that time, will I defer to the advice of SleepingInAirports.com, or will I shell out for an airport hotel? Truthfully, I haven’t decided yet! Good lord, I’m exhausted just writing this out. I can’t imagine how I’ll feel as I actually live out the journey. With the sheer pace at which I’m going to blaze across four continents, I’m expecting there to be a fair bit of sleeping at odd hours, LOTS of coffee, and hopefully zero missed flights! But more than anything, the mere thought that a trip like this is even possible just illustrates the incredible power that lies within Miles & Points, and I really can’t help but marvel at the new adventures that lie on the horizon thanks to my healthy points balances. I’m looking forward to bringing you the best stories from my first time in Africa, my first time in Oceania, my maiden flight on Singapore Suites, my quick stops throughout Micronesia, and much more!